Item #AD-4038-GRN: 18" necklace of irradiated green rough Diamond beads of 22.33 cts. TW with 18Kt. Yellow Gold "S" clasp. 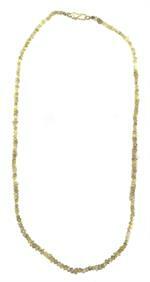 Item #DG-N2242: 16" long, 18Kt. Yellow Gold Necklace on Wheat Design Chain with fifty-five pavé set Round Diamonds of 2.42 Cts. TW. 18.97 grams TW of item. Slide clasp and safety. Item #AD: 16" Necklace of 4-5mm round purple/red Garnet beads with Gold-tone barrel clasp. 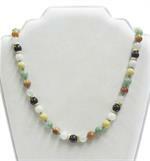 Item #MCT-150: 16" Necklace of 5mm faceted multi-color Tourmaline rondel Beads and Sterling Silver clasp. 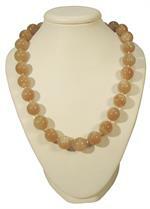 Item BG-6RD-20: 16" Necklace with 6mm rondel Variscite (Nevada) beads and 14Kt. Yellow Gold spring ring clasp. Item #RCK-S1/18-2259: 17" long, 18Kt. White Gold "Y" Choker Necklace with one hundred sixteen prong set Round Diamonds of 1.84 cts. TW. Slide clasp and safety. Item #SC-NLDA-2067-X1: 17" long 14Kt. White Gold Butterfly Necklace with one hundred ninety-eight bead set Round Diamonds of 1.01 cts. TW; Spring ring clasp. Item #SC-NLDA-1850-X1: 17" long 14Kt. Yellow & White Gold Necklace with twenty-three Round Diamonds of .16 cts. TW bead set in White Gold; Lobster claw clasp. Item #SC-NLDA-0736-X1: 17" 18Kt. 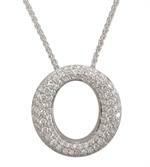 White Gold necklace with ninety-one round Diamonds of .99 cts. TW and slide clasp with safety. Item #SC-NLDA-2166-B1: 17" long 14Kt. White Gold Necklace with prong set 5mm Round Irradiated Black Diamond of .74 cts. and twenty-nine bead and bezel set Round White Diamonds of .44 cts. TW; Lobster claw clasp. 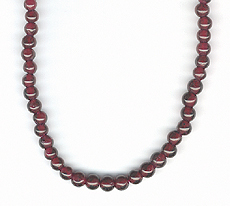 Item #AD-GAR-BN-5: 17-18" long Necklace of 4-4.5mm round Purple/Red Garnet Beads; Gold-tone Hook clasp. Item #DG-N2000: 16" 18Kt. Yellow Gold necklace with snake chain of 22.35 grams, thirty-five round and tapered baguette Diamonds of 1.70 Cts. TW and slide clasp with safety. Item #AD-KB-259: 17.5" long Necklace of 3-6.2mm faceted Kyanite Beads; 18Kt. Yellow Gold "S' clasp. Item: #DB-2822: 18" long 14mm round Malachite bead necklace with Sterling Silver ring clasp. Item #TBM-E71-P112217: 18" 14Kt. 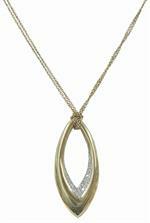 Yellow Gold horseshoe necklace with round Diamonds of .08 cts. TW and spring ring clasp. Item #TM-E50-KEYP19: 18" long 14Kt. 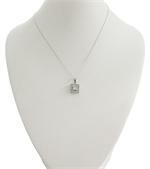 White Gold Key Necklace with round Diamonds of .04 cts. TW; Spring Ring clasp. Item #ARS-128723: 18" long 14Kt. White Gold Necklace with Round Diamonds of .25 cts. TW; Spring Ring clasp. Item #ARS-127611: 18" long 14Kt. White Gold Necklace with Round Diamonds of .20 cts. TW; Spring Ring clasp. Item #ARS-127635: 18" long 14Kt. White Gold Necklace with Round Diamonds of .25 Cts. TW; Spring ring clasp. Item #ARS-103259: 18" 14Kt. White Gold necklace with round Diamonds of .25 Cts. TW and spring ring clasp. Item #SC-PTDAN5577-X2: 18" 14Kt. White Gold necklace with one hundred two round Diamonds of 1.05 cts. TW and spring ring clasp. Item #SC-NLDA-1357-X1: 2" long 14Kt. White Gold pendant with one hundred and seven round Diamonds of 1.74 cts. TW on a 18" long, 14Kt. White Gold chain with spring ring clasp. Item #ARS-127605: 18" long 14Kt. 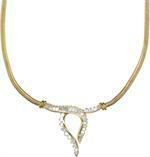 Yellow & White Gold Necklace with Round Diamonds of .20 cts. TW; Spring Ring clasp. Item #ARS-PD2857-Y: 18" long 14Kt. Yellow Gold Chain and 14Kt. Yellow Gold 5/8" long Star Pendant with thirty Round Diamonds of .24 cts. TW bead set in White Gold. Spring ring clasp. Item #AD-4018: 18" necklace of approx. 2-4mm faceted Emerald beads with 18Kt. Yellow Gold "S" clasp. 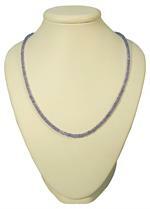 Item #AD-4017: 18" long Necklace of 2.5-3.2mm faceted Tanzanite Beads; 18Kt. Yellow Gold "S" clasp. Item #AD-KOB-159: 18" necklace of 4x6mm-8x12 oval Kyanite beads with 14Kt. Yellow Gold "S' clasp. Item #AD-OKB-89: 18" long Necklace of 12x16mm oval Kyanite Beads; Gold-filled Fish hook clasp. Item #IJCO-10LLB-MGC: 18" long necklace of 10mm round Lapis Lazuli beads from Afganistan with Sterling Silver magnetic clasp. 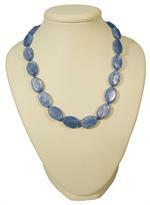 Item #JCO-LL-10-18: 18" long necklace of 10mm round Lapis Lazuli beads with large Sterling Silver spring ring clasp. 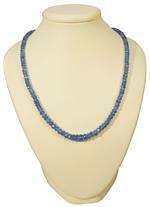 Item #IGM-LL-12-18-249GF: 18" long necklace of 12mm round Lapis Lazuli Beads with Gold-filled spring clasp. Item #AD-MA-75: 18" long Necklace of 3.5-4mm faceted Madagascar Blue Apatite Beads; Vermeil. "S" clasp. Item #AD-MXO-150: 18" long Necklace of 4mm to 5mm rondel Faceted Assorted Color Mexican Opal Beads with 18Kt. Yellow Gold "S" clasp. Item #DB-2725: 18.5" Necklace of 14mm round Aquamarine beads with Sterling Silver spring ring clasp.